I recently put several more Newbery Medal winners on reserve at the library at once—basically, searching for the ones whose names I could remember, since I didn’t have my list with me! 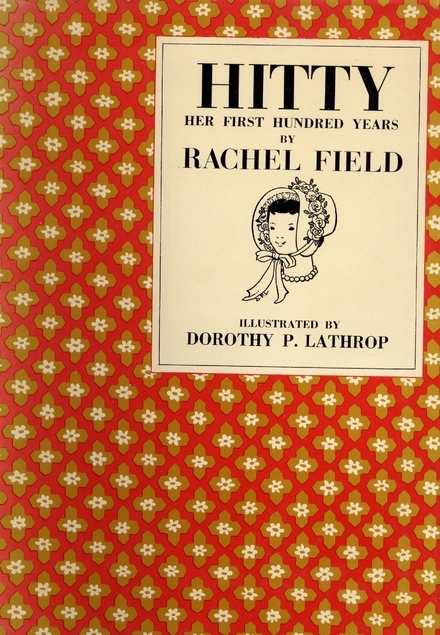 One of those was Hitty: Her First Hundred Years by Rachel Field, because that second part sounded so intriguing. It turns out that Hitty is a doll. First carved in Maine in, I think, the early 1800s, Hitty passes through a number of different families and goes on a series of adventures, including sailing the high seas, becoming a castaway and traveling to India. Over her century of life, up to the 1920s, she belongs to people at every stage of society, experiencing many different owners and many different kinds of life. This book achieved a nice trick, sending Hitty through some very exciting experiences, while making their occurrence plausible. The life of a doll could be a rather staid one, but there’s nothing dull about Hitty’s life—and while the excitement may be extreme, each development follows reasonably and believably. While a castaway, Hitty encounters some island natives, and I don’t think it’s the most positive, politically-correct portrayal (the book does date from 1929). I didn’t think it was too horrible either (Dr. Dolittle is worse), but fair warning that it does have that element. Hitty herself is a pleasant, kind-hearted and extremely patient soul. One aspect I liked of this book is how contented Hitty is being a doll. She doesn’t love everything that happens to her, but she never seems to resent her state in life. Even when she gets shoved into a couch for a decade or two, she accepts that pretty calmly. She can move very slightly on her own (something that happens rarely) but she doesn’t appear to have any desire to be more active. Somehow, that lack of resentment on Hitty’s part made it all okay. I found The Doll People deeply disturbing and was horrified by the dolls’ lives, but that was because the heroine herself was so unhappy. Hitty doesn’t want anything else, so it never bothered me that she was so powerless. Instead, Hitty seems fond of her owners and likes remembering her adventures. Though I will say that it’s hard to write about this without making her sound like a slave!! This was one of the more charming Newbery Medal winners, with exciting adventures, nothing too tragic, and an overall pleasant atmosphere. It’s no Girl Who Drank the Moon, but it was an enjoyable read. “Doll Bones” by Holly Black, 2014 Newbery Honor. Another creepy story about a doll. The premise sounds intriguing. If the story itself is engaging, and the main character is relatable (and likable in some way), then I think the less than “politically correct” parts can be taken into account as a product of the time when the book was written. You have a much more positive view of this book than the last review I read of it! She (was it Betsy Bird?) thought Hitty was dull and insufferable… but I’d be surprised if a book this old didn’t feel dated. Robin McKinley's Very Dark "Sunshine"